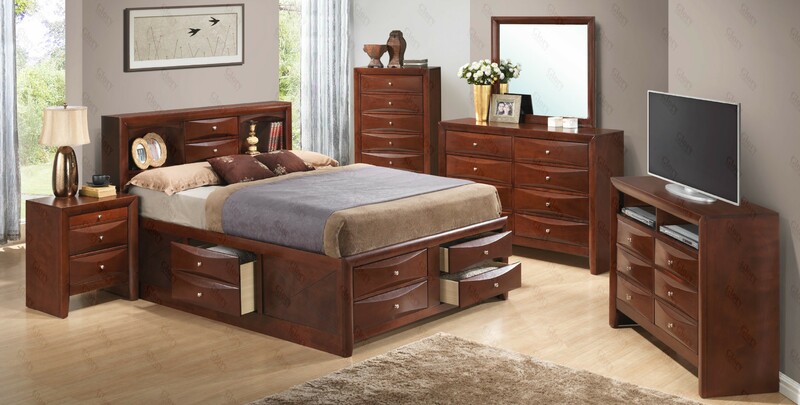 Buy this elegant G1550g bedroom set made from wood and wood veneers of a very high quality which is ideal for furniture. This bedroom set from Glory Furniture is transitional in its design, but it also has a traditional touch. The wooden material makes it durable and long lasting, and the beautiful design gives it an attractive look. The bed room set has very good storage facility with convenient drawer system. The bed has a nice storage facility with six drawers, one on either side and four on the footboard. This facility provides the owner the liberty to store bedding, clothes and other items. The drawers are very useful for keeping the things inside but at the same time they are so nicely designed that they can be considered as points of attraction. The wooden finish is done with high quality wooden enamel and the effect is easily felt by the glossy look of the exposed surfaces. The nightstand is also unique with two drawers and a pull out tray. The TV dresser and the chest also offer great storage conveniences with six and eight drawers respectively.